For years you have been told to lighten up the bathroom with pastel colours to bring out the best in the room, but we are here to explain that dark bathrooms also are attractive and eye-catching. You can select a monochromatic approach with one shade throughout the entire bathroom, or you can mix a variety of deep colours together to heighten the dramatic effect of the dark bathroom. While you may think this only includes the walls and flooring, you are mistaken since fixtures, cabinets and benchtops also come in different shades to help you complement your efforts. Select your custom cabinets first in your endeavour to create a dark, attractive and customised bathroom design. Cherry or mahogany are two prime examples of natural wood tones that fit this decor style, or you can choose from a wide assortment of paint tones. For the benchtops, you have shades that range from dark grey to black in natural stone or laminates. Paint, tile or wallpaper the walls with deep shades that complement your cabinetry in an ideal manner. In the tile or wallpaper, you can select from a variety of patterns along with the deep shades that work for your decor. Even paint applications can be quite creative in nature. Fixtures such as bathtubs also are available in dark shades along with the traditional white. You can select from an assortment that ranges from grey to black. Faucets can add their special touches in this type of bathroom style since they come in such shades as brushed gold, polished brass, oil-rubbed bronze and even black just for a sampling of what is on the market today. 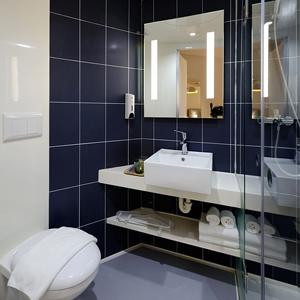 Bathroom flooring options today include vinyl sheeting, ceramic tiles, laminates and others. All of these come in a wide range of colours and patterns with some strikingly attractive dark ones. Just choose the shades and patterns that best suit your needs. Allow the light to drift softly through the window to shed a bit of illumination on your design efforts. By doing so, even when the lights are off in the room during the day, you will be able to admire the rich beauty of your dark decorating scheme. Choices in light fixtures today offer dark tints for the globes or shades and antique finishes on the metallic parts of the fixtures or even black. Reach out to Concept Bathrooms & Construction for further ideas to make dark bathrooms attractive and functional. We will turn your ideas into reality in a high-quality manner.